Toy Fair fast approaches and I think were all wondering; will Star Trek feature? I think what were going to see is a soft reboot of the line. Well see the Reliant Im sure but more importantly I think were going to see a range of Kelvin Timeline merchandise; the 2009 Enterprise and a new range of action figures. Id love to see a 2009 Enterprise, but Id be surprised if we see anything Trek from DST. Even the Reliant. Ive stopped having hope for anything from DST. I don't expect DST to ever release any more Trek Minimates, its been years since they last did. Haha, at least they were honest. 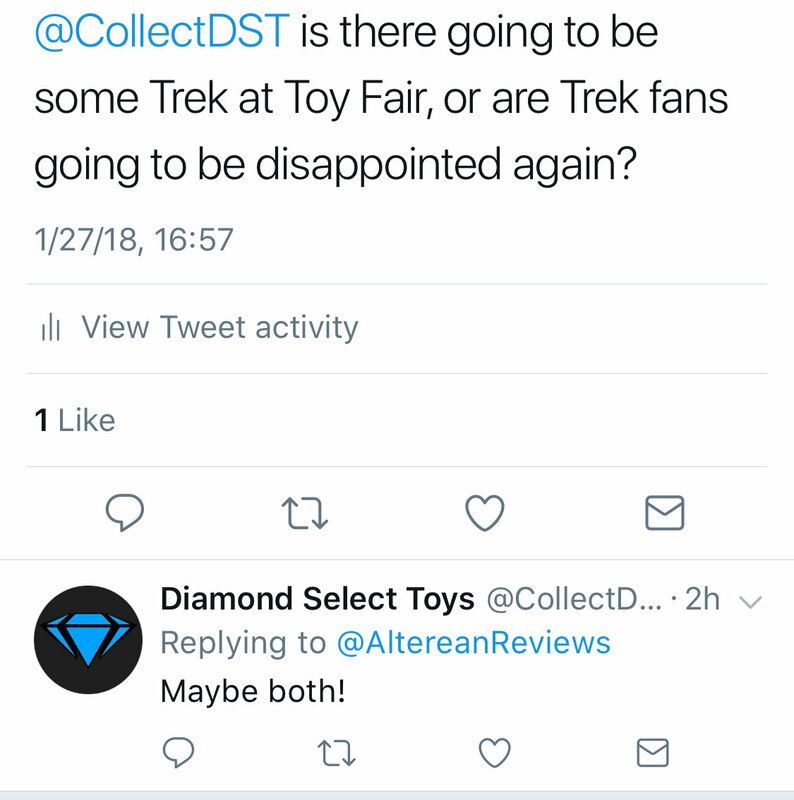 Also why are we looking to DST for Star Trek at Toy Fair? Is McFarlane going to be there, that seems like a much more promising line. I'm intrigued if they are going to be making Kelvin stuff since they mentioned expanding the license however long ago. I still see DST as my only hope for a nice model of the Kelvin Enterprise, and at this point that's probably the only DST Trek product I'd buy. Seeing Mcfarlanes stuff is also exciting, will more than likely buy the phaser, Kirk, Picard, and give me Captain Lorca damnit. I don't really collect the ships or role-play so for me not counting re-issue figures they've essentially been out of the business for many many years now. I'm not excited about McFarlane yet, they're just not that different from what I already have and I'm not going to get into the line if they don't expand into more characters, full crews, aliens etc. I'm excited for the potential though so I'm hoping there are some surprises. Either way McFarlane I think is the only hope. I hope you guys get your last few ships though, good luck! I might get jazzed about McFarlane stuff if they decide to do construction sets in scale with Minimates but Mega Construx still has that category locked up. I really like their construction sets. They don't look nearly as cartoony as Mega, Lego, Minimates and all the others. They're really like mini action figures. With the scale there's a lot of great potential. They could do a whole bridge collection series and have bridges from each series. Shuttles, lots of random figures, other interior sets, etc. if they go that route I could end up spending lots of money. I also like how realistic their construction sets are. If Mega Construx or whatever they are now doesn't do anything with the license, I hope Mcfarlane gets the option to make them. I would think they're different enough that they could both exist at the same time. Even if not Mega seems to be done, the Picard and Borg are the only recent thing they've done. Id not buy McFarlane construction sets. Its Lego or Mega Construx for me. As for Diamond Select...seems as though theyre still working on a single figure, the Reliant and a phaser... Ive never known a company take so long to get something out. Plus... seems to me that this radio silence on their Star Trek line may be as a result of them pushing their licence into a different direction, an alternate direction... a Kelvin Timeline direction... would explain the maybe both comment seeing as how divisive the Abrams movies have been among fans. Seems like they're almost completely done. It must be no real cost for them to hold onto the license and so I think they're hoping to get a couple more items out and hold onto it. I admire that they've done so much and still seem to have a few things on the back burner for those of us that followed their line. It's probably time for them to actually get those last couple items out and wrap it up though. I loved the Romulan BoP....did that not sell well? I didn't get the Select Khan figure, how well did that sell? Still would buy a Reliant but have no interest in Kelvin stuff. DST only released two new items in 2017, the Romulan Bird of Prey and Khan? I thought Khan and the Bird Of Prey were both 2016 releases? They had the 50th packaging on them. I mean I think theyre done with classic Star Trek after the Reliant, Borg Drone and TNG phaser. I think well see Kelvin Timeline product from DST and classic and Discovery product from McFarlane Toys. I cant see them doing anything with the Kelvin stuff. Everyones pretty much moved on from those movies and many are starting to realize in hind sight just how horrible they really are, much like Star Wars fans did with the prequels. Its time has passed, not to mention if DST were going to do anything it would be at least 2-3 years out from now and they would be an even more distant memory. I hope we see some cool stuff. I'd love to get an update on the TNG Phaser and see the Reliant. After that? Well, I'd buy a Kelvin Enterprise, still, to replace my Playmates one in my line-up. I'd also love if DST still did Discovery ships. The Discovery and Shenzhou, really, would be all I needed. But it doesn't SEEM like McF is touching the electronic ships so it might be a space they could come into. But, it's probably an additional license? It'd be neat if they kept their Select line going, though I'm not expecting it. If nothing else, an Admiral Kirk with chair to go with Khan would be cool. I hope we at least get to see the Reliant.